This site started to evolve in the Autumn of 2012. I had been delivering training and Vision and Planning workshops for schools looking to go 1:1 with iPads. The reality of cute is that the vast majority of schools are not going to go 1:1 with any devices. As a result very much against the tide this space was born to help support schools using just a few devices. The basic premise was if you could afford 32 iPads (a class set) it is better to split the devices into 4 sets of 8 and have 8 iPads in each classroom. That can be used for independent study/enquiry and each table/group would in effect be connected to the internet. 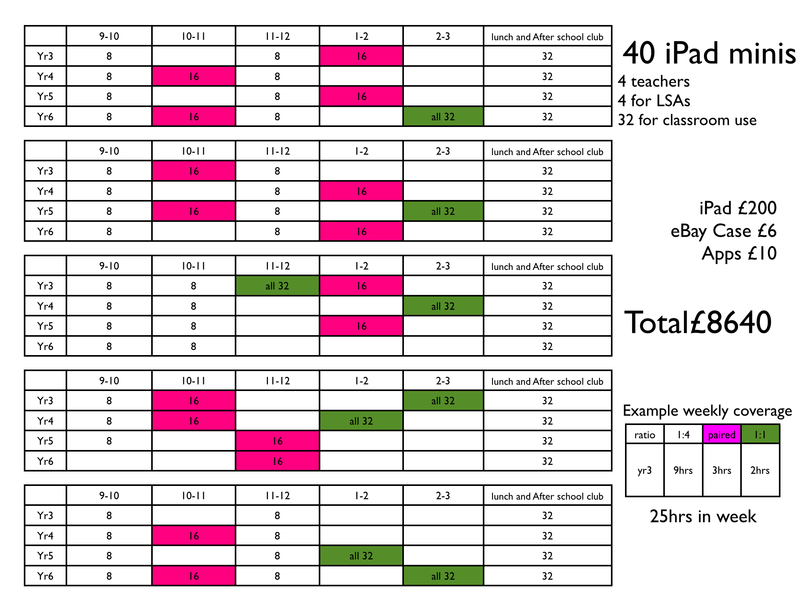 If the school timetabled the usage of the 32 iPads some sessions during the week could be 1:1. Managing the the work is helped by apps like Showbie and more recently Seesaw and Google Classroom. 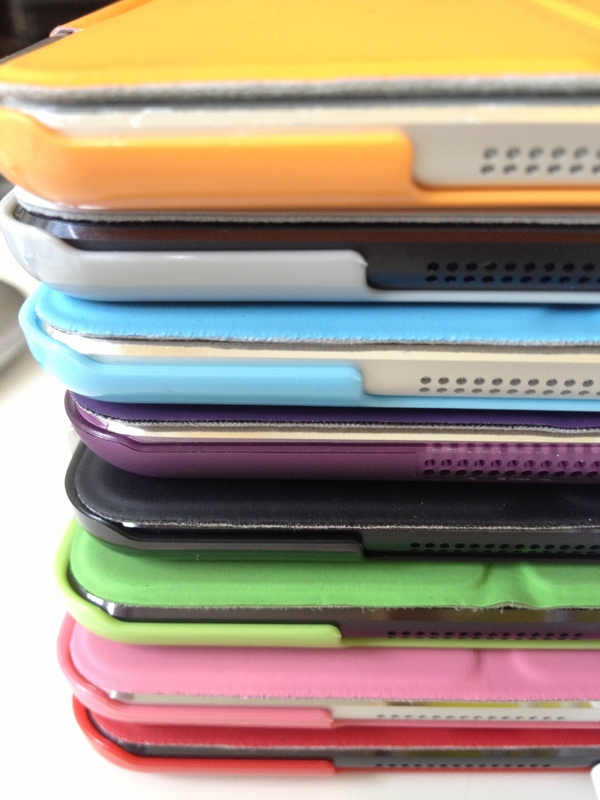 These days I have 15 iPad minis that I use for workshops with pupils and teachers and sometimes a combination of both. These iPads are crammed with the latest apps and best ways of working. So if you need to refresh your use of technology and need some new ideas you can book me and my 15 iPads for a day, an afternoon or a twilight. My workshops with pupils are as much about group work as they are technology. you can see here that the iPad is only a small part of the whole learning process. Likewise, my Staff development sessions are “hands on” and appreciative of the fact that not all teachers are confident with technology. Having said that, we can see some nail-biting going on here at the beginning of a session! It is better to have 8 iPads permanently in the classroom than share 32 iPads across 4 classes. Many schools are looking at 1:1 projects or bring your own device projects (BYOD). This is part driven by some common sense, budgets and of course encouraged by Apple and others that want to ship a shed load of product. Think about this for a second, well maybe a little longer… 8 iPads across 32 learners, offers in a typical state school, a 1:4 ratio. Crudely put that could be 25% digital, 75% physical world time. In my school (If I led one) I would want as much F2F time (sorry Face to face time) as possible. Kids sitting silo’d with iPads in classrooms all day, is not a good thing. Neither is “disconnected” learning. So imagine a school that is 1:1 25% of the time. Will the kids be disadvantaged in relation to a 1:1 school? I don’t think so. Most learners in secondary will own a mobile connected device that could fill some the gaps even when they shouldn’t have one in school ;-). The problem with BYOD is managing projects and processes. 8 iPads will provide a core platform. From this platform a wide variety of other web enabled devices can be used at home to support this using free learning/publishing spaces. FrIs that a good balance? It ‘s better than 0. The fact that many kids will spend hours at home connected and peering at screens isn’t really something to celebrate, so when they are doing this in school the tasks have to be good and where possible be continued at home on a different device. This is handled by using web services that work across different platforms. The stock cupboard for the contemporary teacher is the internet and its free web services. Scaling this up is interesting… take the class set. Encourage the device to be available on each table. Have clear rules about it’s use. The 8,16 and 32 relate to the numbers of iPads allocated for that lesson. You could split the ratios many ways. The blanks are where the iPads are being used by another class. If teachers know they have access to the device they can plan accordingly. There are hundreds of schools trying to use class sets of iPads and struggling. This site focuses on using 8 devices in state education classrooms. This share space is about maximising impact and minimising cost, stress and hassle with iPad technology in the classroom. It is an experimental space that doesn’t confess (like some iPad Training/Consultancy folk) to have all the answers. It is truly independent. Over the last 3 years I have worked on many iPad projects. Some of the first large 1:1 iPad ownership projects in UK and many more modest projects. St Silas in Toxteth and Christchurch Primary in Walshaw Bury have been incredibly supportive. All of these projects lead me to believe that 1:1 iPad in school is the best model. However getting to that point is difficult you create that model is complex. I still work with 1:1 schools. I’ve made some great friends and in most cases I am continuing to work with these 1:1 schools and new ones that want my help will get it. I left Apple in 2007, a safe job, security, good earnings to go back to education. This project is not about ego or money making. I’m not interested in having loads of Twitter followers etc. This is isn’t about ego, showboating, making a ton of cash. Unlike these so called iPad Training and Consultancy companies charging £700 to £1000 a day, this project has integrity.